This is a turning point in the long struggle to finally provide health care to everyone: This month, Senator Bernie Sanders will introduce his bill in the U.S. Senate for Medicare for All. It’s long past time. Even with the Affordable Care Act, millions of Americans still don’t have health insurance. And even if you have insurance, that’s no guarantee you can afford to see a doctor when you need to. The costs, especially of deductibles, are so expensive that many people can’t afford to use the insurance they have. That’s why Medicare for All matters. Bernie’s bill will create a single-payer system that will save households thousands of dollars a year while making sure everyone can get the health care they need, when they need it. We can't wait for Bernie's bill to be introduced. But you don't need to wait to show you support it. Democracy for America is helping to build massive grassroots support for this legislation NOW, so that once it is finally introduced, Democrats from around the country will feel serious pressure to support it. Are you ready for truly universal health care? 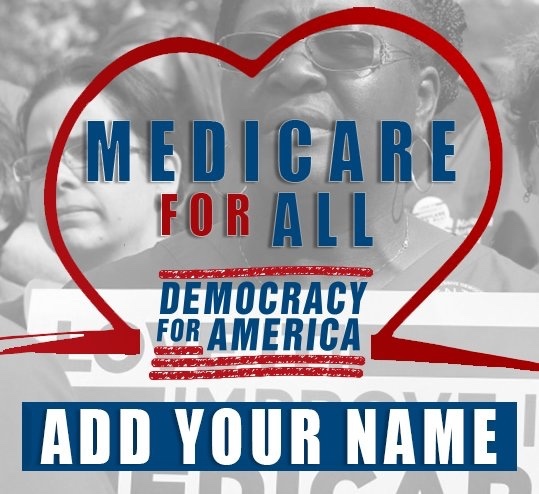 Sign up here to become a public co-sponsor of Bernie Sanders's Medicare for All proposal today.